This quick supper combines two easy concepts that any budding home chef should master: Scrambled eggs and creative use of leftovers. Scrambled eggs are just the best: Easy to make, cheap as dirt, infinitely customizable, and ready in minutes. They’re good for a quick breakfast or a simple dinner, and they’re a really great way to make your friends happy when you go in together on that weekend share. And the ability to look into your fridge, pull out a thing or two, and throw together something decent to eat is a skill developed by practice and one that will start to make you very happy as you get better at it. I had some friends over on Saturday afternoon, and everyone brought some snacks. When I opened my fridge on Sunday night, tired and not really feeling like cooking, I saw leftover smoked salmon and a little chunk of herbed goat cheese. 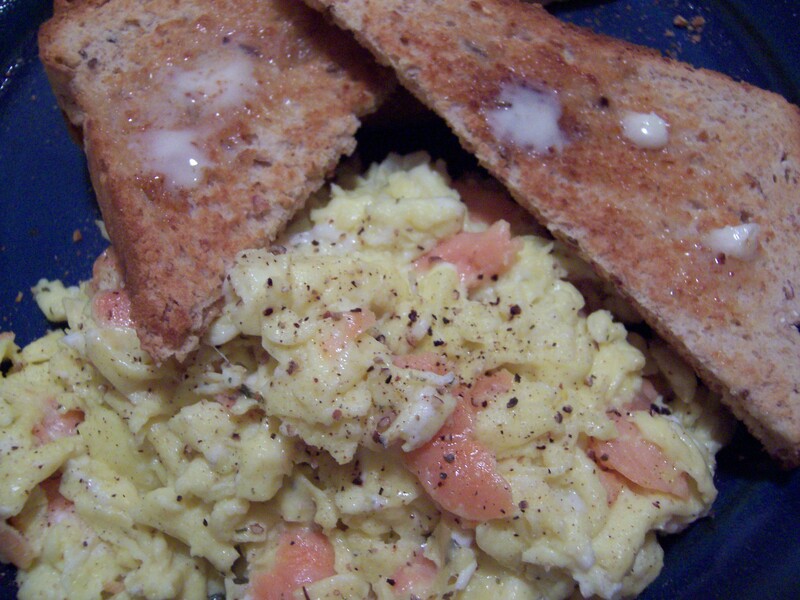 And with that, it was scrambled egg time. 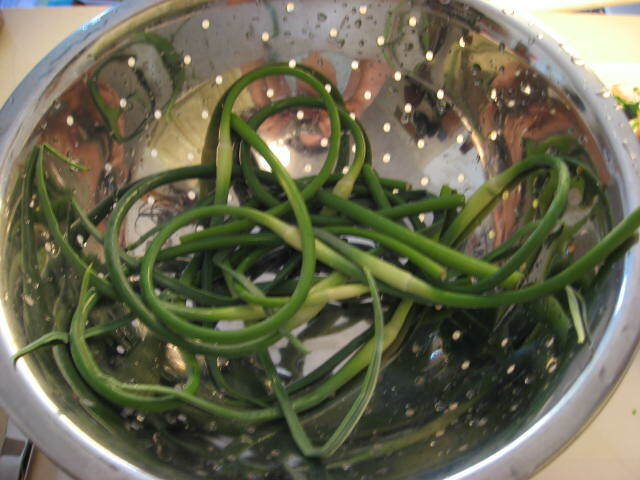 These are curious creatures, these garlic scapes. As you can see from the photo above, they look a bit extraterrestrial. But they are related to the garlic we all know and love, just ever so much more subtle and tender. After garlic has been growing a little bit underground, a shoot will poke through the dirt, and grow into this beauty of a tendril. If left alone, the tendril will simply turn into the same texture as the white paper outer layer of the garlic we’re all familiar with; if left attached, the scape also will inhibit the garlic bulb’s growth. So, farmers cut off the scape and have an additional delicious product to sell, the garlic does better, and we all win. At this point, arugula has become so much of a yuppie cliché and emblem of the gourmet-ization of America (see David Kamp’s The United States of Arugula), that it seems a little silly to even write about it. Shouldn’t I be onto bigger and better lettuce greens? Maybe so, but I love arugula. I just love it. It’s so peppery and yet so delicate. So I say bring on the yuppies, if it means I can find arugula in any supermarket. I’m even more of this opinion now that I’ve realized that arugula is a multifunctional green: it can be used both raw and cooked. 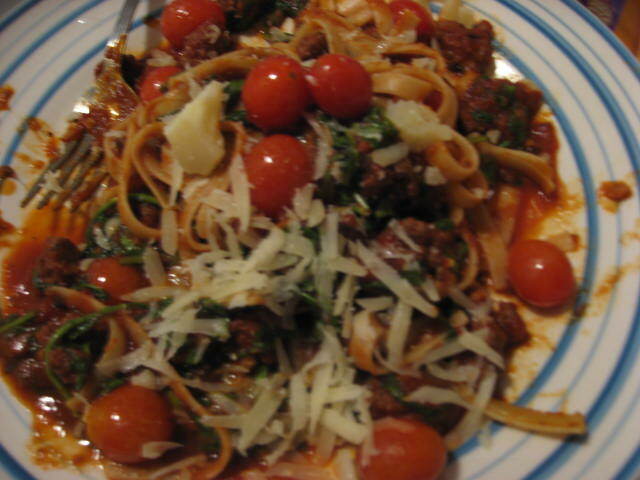 Usually you eat lettuces raw and greens (beet greens, kale leaves, chard, etc) cooked. I thought spinach was the only place the Venn Diagram overlapped, but as it turns out, arugula also represents the best of both worlds. Or rather, can at least also be wilted into various dishes (imagine trying that with romaine…it would not be pretty). I don’t know, however, that I would attempt to wilt pure arugula and eat it plain. So, before going home, I actually made a weekend stopover in Portland, Oregon, both to visit a friend and to check out the restaurant/farm/local food scene I have been hearing so much about for the last couple of years. The city — filled with microbreweries and food co-ops — did not disappoint, and the farmers’ market was particularly stunning. Not even one of the biggest markets in Portland, and not even up to full steam yet as we just finally get into warmer months, the market still offered an abundance of riches not to be found even at the Union Square market in New York. 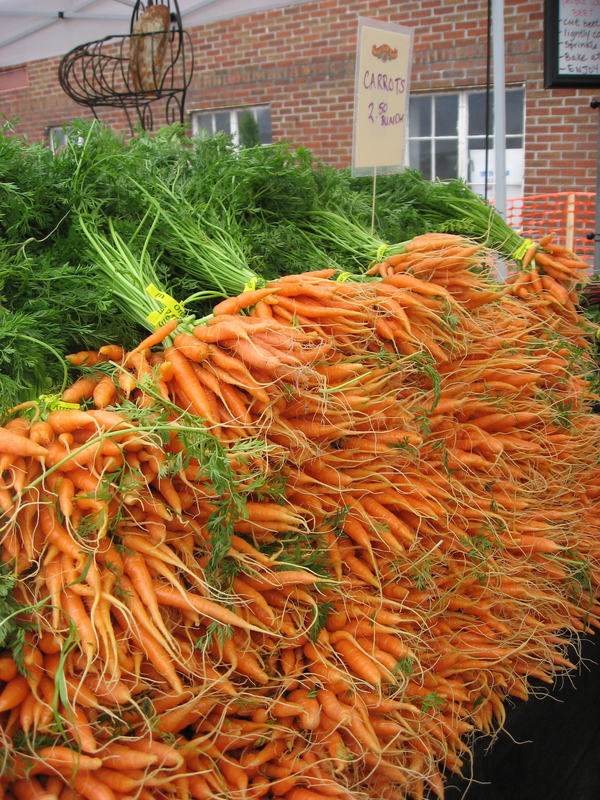 Exhibit A: the giant pile of beautiful carrots you see above (and that we bought a bunch of to take with us as a snack on our glorious hike). As good as the restaurants are, with produce like this, I had to cook at least one meal. We just picked what looked best (jewel-like beets, incredibly tender lettuce) as the starting point of our meal, and then used the co-op and Trader Joe’s (no shame!) to fill out the rest of the meal. 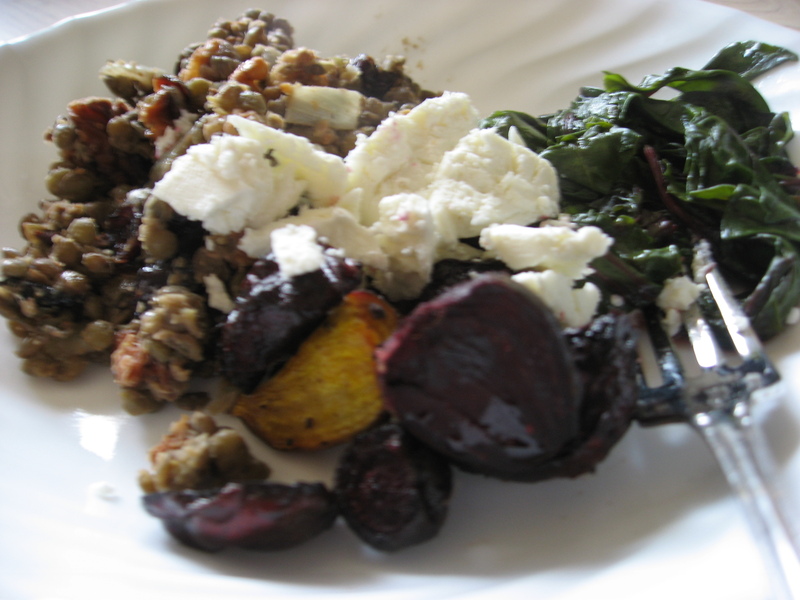 And so our meal: Red Lentils with Cayenne, Cranberries and Toasted Walnuts; Wilted Beet Greens; Roasted Beets; and Simple Green Salad (not pictured, no recipe). We crumbled goat cheese over the whole thing; I would suggest adding goat cheese to any of these recipes if you make them individually.